Note: If Your Original Capacitor is Plastic, This Replacement is Slightly Smaller and Might Need Field Modifications for Mounting. 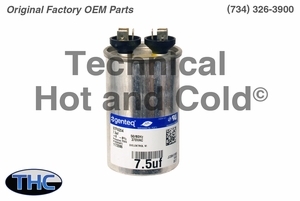 Diameter of Can: 1 3/4"
Technical Hot and Cold offers the ICP 1172086 Single Run Capacitor OEM replacement part for sale online and over the phone. Call (734)326-3900 to speak with a technician for additional information on each ICP replacement part.